Theatre nurses at Wollongong hospital celebrate their win. 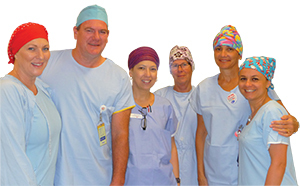 Crackdown on unreasonable overtime brings relief to Wollongong Hospital’s dangerously understaffed operating theatres. Theatre nurses at Wollongong Hospital won a staff increase through a campaign that included refusing to work excessive overtime. The Illawarra Shoalhaven Local Health District has approved an additional 4.4 full-time equivalent (FTE) nursing positions, including a designated clinical products nurse and holding bay nurse, plus more clerical staff and operating assistants – about nine FTE theatre positions in total. The approvals followed a seven-month campaign in which nurses stuck to Award conditions and sought to apply minimum staff levels closer to standards set by the Australian College of Operating Room Nurses (ACORN). Assistant General Secretary of the NSW Nurses and Midwives’ Association, Judith Kiejda, said theatre nurses had put up with almost two years of chronic understaffing. Judith said nurses came under tremendous pressure to abandon their campaign, especially after it resulted in the cancellation of some elective surgery. “Theatre nurses deserve our congratulations for drawing a line in the sand and holding together as a team in order to bring about improvements to a dangerous and unsustainable situation,” she said. “We achieved some good outcomes,” Clinical Team Leader Jacqueline McGovern said. “We now have a designated clinical products nurse and a check-in nurse helping the front desk, plus a number of positions have been filled including the Senior Nurse Manager 5. Other positions such as NUM 3 are being advertised. “We have increased staff numbers to ACORN standards 2008, which is an improvement.” Registered nurse Jenny Spillane also welcomed the staff increase and said preadmission of patients and booking of theatre lists had improved. Inadequate theatre staffing was an issue as far back as March 2011, when nurses first raised it as a workloads issue. The Illawarra Mercury newspaper reported that some theatre staff were being asked to work double shifts – a situation described as unfair to nurses and unsafe to patients by the then opposition health spokeswoman, now health minister, Jillian Skinner. After management reviews of staff levels went nowhere, in May 2012 NSWNMA members voted to introduce measures to ensure safe patient care until additional staff members were permanently employed. Members resolved that at least three nurses would be present in theatre during an operation, in line with minimum ACORN staffing requirements. Staff required to wear a lead apron for more than an hour would take a 10-minute break as provided for in the Award, and nurses would not do work supposed to be done by non-nursing staff, such as cleaning of theatres and positioning of patients. In July 2012 nurses called an extraordinary workloads committee meeting to seek employment of agency staff as an interim measure, but the Local Health District CEO refused. The Illawarra Mercury editorialised that understaffing of theatres was “shameful” and “outright dangerous”. Members voted for stronger action including restricting overtime and refusing to extend shifts. Permanent part-time staff members agreed they would no longer routinely work above their contracted hours in order to backfill vacancies. These steps were designed to stop theatres being booked on the assumption that nurses would work overtime. Jacqueline McGovern described union meetings as “feisty” as they attempted to balance the interests of staff who were working overtime under duress, with other, mostly part-time nurses, who wanted extra shifts. Jenny Spillane said no one wanted patients to miss out on surgery and people sometimes did extra shifts and overtime so operations could proceed. “Keeping the group together was hard at times but eventually everyone came on board,” she said. By the end of July operations were frequently being rescheduled to ensure lists were not overbooked. Local Health District (LHD) management twice threatened to take the nurses to the Industrial Relations Commission unless the “bans” were removed. The union replied that this would give nurses an opportunity to show the Commission that a staff shortage existed and that nurses were simply working in accordance with their Award. The LHD had been given enough time to recruit nurses or approve agency staff and the campaign would continue. Jenny said nurses came under “immense pressure” to abandon their campaign. Staff increases were finally approved in November 2012 – 20 months after nurses first raised the workloads issue.